There’s no time like lunch to start reducing, reusing and recycling. 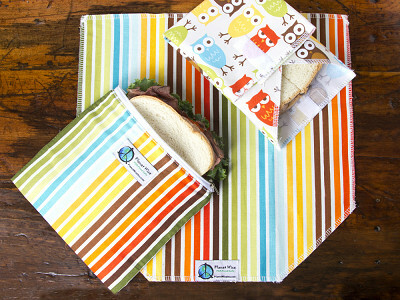 With Planet Wise Reusable Sandwich Wraps and Zipper Snack Bags, being green couldn’t be easier. 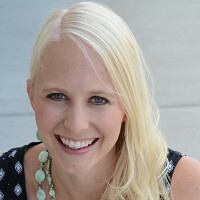 As parents to three young children, the founders of Planet Wise, Nicki and Jesse Maynard know what happens when a child removes a sandwich from a bag. The sandwich lands smack dab on the table whether the surface is clean or not. That’s why they designed their Reusable Sandwich Wraps to double as a place mat. Nicki and Jesse also know that while fruits and veggies make great snacks, they can also make a bit of a mess. Hence, the zipper closure and leak proof seams of Planet Wise Snack Bags. Made in the USA, these eco-friendly alternatives to plastic bags add punch to your lunch with your choice of bold cotton prints. Whichever style you choose, the inner lining is made of EVA, a FDA food safe material that’s easy to wipe clean after use. All Planet Wise bags can also be washed through and through by hand or in the washing machine. The next time you pack your lunch, why not bag the plastic and choose Planet Wise. Planet Wise products are eco friendly and designed to replace disposable items you use everyday. They reduce waste, save money and look rad. Use instead of tin foil and plastic bags, which clog our landfills and our hearts. Questions? Comments? How much do you love us? There’s no time like lunch to start reducing, reusing and recycling. 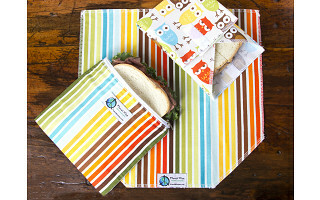 With Planet Wise Reusable Sandwich Wraps and Zipper Snack Bags, being green couldn’t be easier. As parents to three young children, the founders of Planet Wise, Nicki and Jesse Maynard know what happens when a child removes a sandwich from a bag. The sandwich lands smack dab on the table whether the surface is clean or not. That’s why they designed their Reusable Sandwich Wraps to double as a place mat. Nicki and Jesse also know that while fruits and veggies make great snacks, they can also make a bit of a mess. Hence, the zipper closure and leak proof seams of Planet Wise Snack Bags. Made in the USA, these eco-friendly alternatives to plastic bags add punch to your lunch with your choice of bold cotton prints. Whichever style you choose, the inner lining is made of EVA, a FDA food safe material that’s easy to wipe clean after use. All Planet Wise bags can also be washed through and through by hand or in the washing machine.